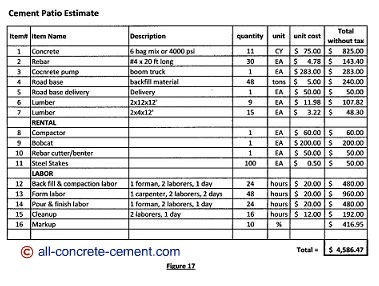 Tips for estimating the cost of cement patios. These needed to know how to concrete patio estimating procedures are critical to keeping track of your budget. Refer to cement patio for tips on prepping elevated cement patio. Whether you are a contractor, an aspiring diy concrete patio enthusiast, home owner checking the number for your concrete patio ideas, or evaluating the cost for your concrete patio design, knowing how to estimate is critically important. One of the weaknesses of design professionals is their inability to estimate cost. As far as concrete work, it is always 3 steps process before a reasonable estimate can be made. An architect has to come up with a design followed by a structural engineer to design footings, foundations, slab, etc before it goes to a contractor for an estimate. This process can take months. Ok, back to cement patios estimate. 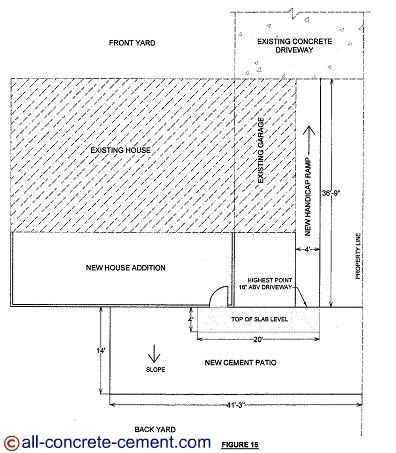 Refer to figure 17 as it outlines the materials, rental, and labor needed for patio shown on figure 15. The biggest material cost item is the price of concrete. Let’s calculate the amount of concrete needed. The concrete patio slab is 4 inches thick, 14 feet wide by 41 feet 3 inches long - total area 577.5 square feet. To figure out volume, multiply the area by 4 inches thick, 577.5x 4/12 yields 192.5 cubic feet. Since concrete is sold in cubic yard, divide the total cubic feet by 27 to convert to cubic yard (192.5/27 = 7.13 cy). Additional to the slab, the volume for the thicken edge need to be calculated. This calculation is shown on detail 11. The 69’-3” shown are the sum of two 14 feet sides and one 41’-3”. The 21 feet total length on the right side is the length from the new house addition to the property line as per figure 15. Combining the thicken edges with slab: 2.7+1+7.13 = 10.83 cubic yards. Concrete is sold in quarter yardage increment thus 10.83 becomes 11 cubic yards. For 6 bag mix or 4000 psi concrete mix, it not only varies widely from state to state, but local areas to areas but for the sake of this discussion $75 per yard is used. There are two rows of rebar at edges. Rebar comes in 20 feet length - in the rebar world they are called sticks. This estimate is to figure how many 20 footer sticks needed and will be cut to length on site with a rebar cutter that is also can be used for bending dowls. The 14 feet width requires four 20 footers, additional 4 for the 41’-3” length, and extra 2 for the 21 feet side next to the new house addition. The total 20 ft sticks required for longitudinal reinforcements is 10. The pieces cut from the 14 feet sides will be used to extend the 41'-3" & 21' reinforcements. The bent dowls will be 4 feet total length with 14 inches bent shorter leg. As shown on figure 16, these dowls spaced 24 inches on center. There are 8 required along the 14 feet width, 21 along the 41’-3” length, and 11 along the 21 feet side for 48 total locations. Every 20 footer will produce 5 locations, so total 20 ft sticks require for the dowls are 10. Since the pour is behind the existing house and garage, there is very little room to maneuver the cement truck. The best option is to get a boom concrete pump truck. A $200 for two hours should be enough to for the job. Since there is no area for the pump to wash we need to add $50 plus $3/yard pumped for a total cost $200+$50+$33 = $283+/-. A line pump that can pump normal weight concrete can cost as low as a third of the cost pump truck, keep that in mind. The area of the patio is 577.5 square feet which is the same area that need fill material. To calculate the volume of road base needed, multiply the total area by the height of 16 inches, 577.5 sf x 1.33’ = 768 cubic feet. Convert to cubic yards 768/27 = 28.4 cubic yards. Assuming that one cubic yard road base weigh 1.3 tons, we have 28.4x1.3 = 36.9 tons @ $5/ton plus $50 delivery for a total $235+ tax. The form work per detail 10 requires 9 EA-2x12 x 12 feet long & 9 EA-2x4 x 12 feet long. Additional six 2x4 were added for braces per detail 11. A trip to your lumber yard stores or their websites should get all the material cost needed. 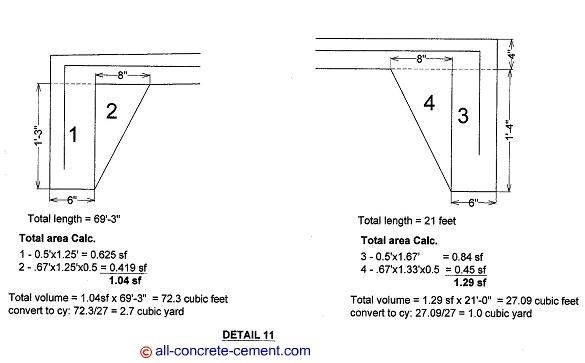 Figure 17 is a great guide for estimating cement patios or concrete patio slab. Rather than calling contractors for bids, you can easily estimate your concrete patio ideas or concrete patio design by figuring the material needed. Of course the labor will be different from contractor to contractor but the material will be very close depending on how good suppliers give certain contractors. A few years ago my friend excitedly approached me for some advice on a $13,000 job he just got. The project was to build a concrete garage with suspended concrete slab. After going thru the plans, it was determined the his total bid was lower than the cost of material. These procedures will help you determine the quantity of material needed which will help you gain rough idea of the cost of your project. If your contractor's total bid is lower than the material you estimated, ask for his material quantity to compare with yours but be very careful awarding the job to him. Chances are he may have missed something and he will not discover the mistake until he is in the middle of the job. This will lead to short cut and poor workmanship and/or outrages change order charges to cover the loss. Learn more cement patio concrete patio designs Check this link out for carport, garage, or shed ideas to be put over your cement patio.